Healthy Lemon Raspberry Muffins Recipe (GF, V): this moist ‘n easy lemon raspberry muffins recipe is gluten free & vegan! 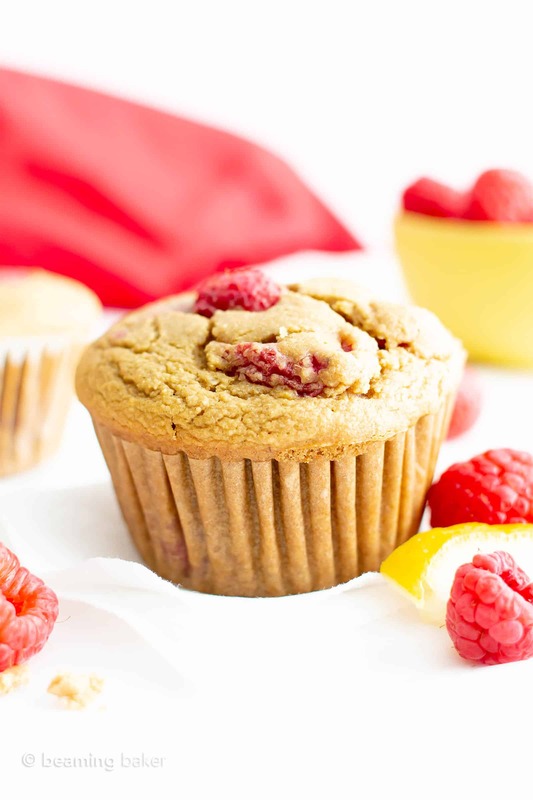 A healthy lemon raspberry muffins recipe that’s bursting with raspberry flavor! Gluten-Free, Vegan, Dairy-Free, Refined Sugar-Free. Add to that… y’all have been asking me for non-chocolate (!!) fruit- and lemon-based, gluten free vegan muffins over on Instagram. I’m happy to oblige with today’s delightfully vegan and gluten free easy lemon raspberry muffin recipe! It’s got lemon and raspberry (say what??? Shocker!!!) and is made with all the simple, whole ingredients you love. If you’re searching for more lemon-based vegan gluten free desserts, try my lemon coconut macaroons, healthy lemon poppy seed muffins and my newest (and favoritest) easy vegan lemon poppy seed almond bread. 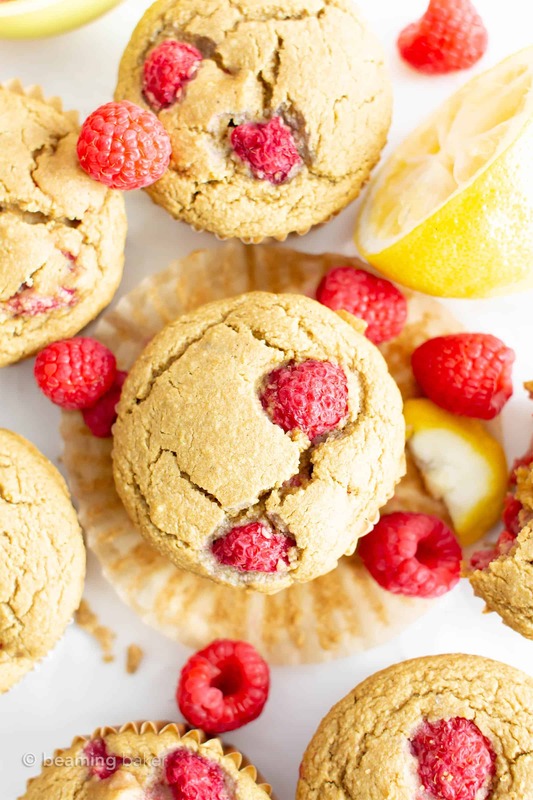 Are these Healthy Lemon Raspberry Muffins: Gluten Free, Vegan, Dairy-Free? Yes to all three! These healthy lemon raspberry muffins are gluten-free, vegan, dairy-free and refined sugar-free. (Not to mention egg-free.) Just be sure to use certified gluten free oat flour when gathering your ingredients for making these healthy lemon muffins. Can I Freeze these Easy Healthy Lemon Raspberry Muffins? I wouldn’t recommend it. These healthy lemon raspberry muffins are best enjoyed the first day. Since we’re using healthy, fresh ingredients, such as fresh raspberries (which are super juicy), the lemon raspberry muffins become moist very quickly and will spoil fast. How do I turn this Vegan Healthy Lemon Raspberry Muffins recipe into Lemon Bread? Try my Easy Vegan Lemon Almond Poppy Seed Bread Recipe. Just leave out the poppy seeds (or don’t because: they’re amazing). Can I Use Orange Juice in these Healthy Lemon Raspberry Muffins? Yes! Swap the lemon juice for equal amounts of orange juice, and use orange zest instead of lemon zest. I mean, if healthy lemon raspberry muffins aren’t your thing, try these Healthy Gluten Free Orange Cardamom Muffins or this Easy Orange Muffins Recipe instead. What Can I Substitute in this Gluten Free Easy Lemon Raspberry Muffins Recipe? 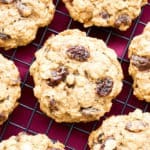 Gluten free oat flour: swap with gluten free all purpose flour or homemade oat flour. Blanched almond flour: swap with almond meal, cashew flour or sunflower seed meal. Non-dairy milk: swap with your favorite vegan milk beverage. Lemon juice: swap with orange juice. Lemon zest: swap with orange zest. 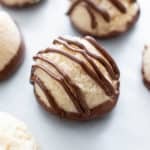 Coconut oil: swap with melted vegan butter or flavorless oil. Coconut sugar: sub with organic brown sugar or organic cane sugar. Maple syrup: sub with liquid sweetener. Try date syrup, agave or honey (if not vegan). Raspberries: swap with your favorite fresh fruit, like blueberries or blackberries, but not, like, a whole orange. Hehe! Happy Lemon Raspberry Muffins! 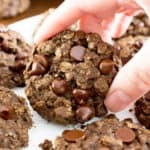 <— Is it just me or does baking healthy gluten free muffins just brighten your day? Something about homemade can’t be beat. 😉 Especially when we’re baking with our loved ones. 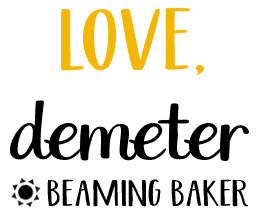 Sending you all my gratitude for baking with me. 🙂 I can’t wait to hear what you think! 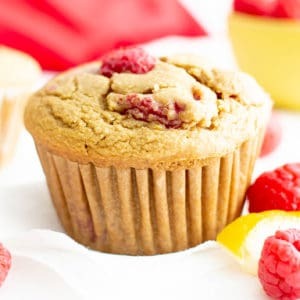 Healthy Lemon Raspberry Muffins Recipe (GF, V): this moist ‘n easy lemon raspberry muffins recipe is gluten free & vegan! 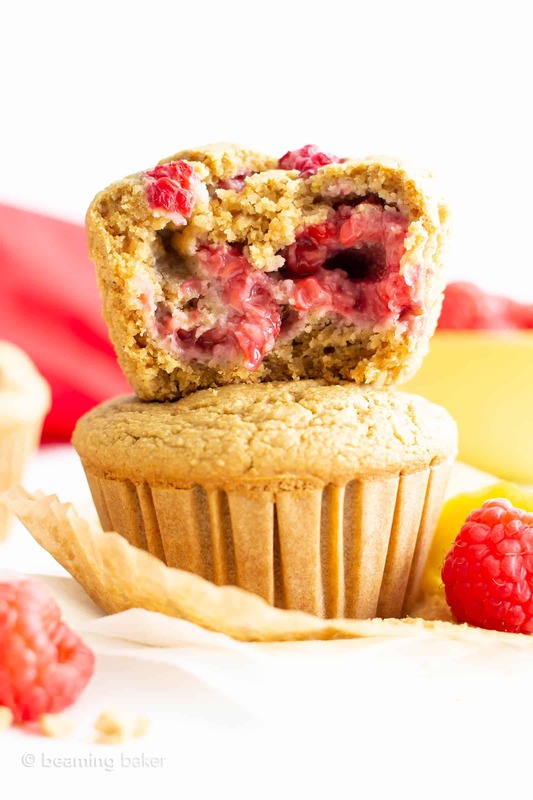 A healthy lemon raspberry muffins recipe that’s bursting with raspberry flavor. Gluten Free, Dairy-Free, Vegan, Refined Sugar-Free. In a large bowl, sift together all the dry ingredients. In a medium bowl, whisk together all wet ingredients: water, milk, lemon juice, lemon zest, oil, sugar, maple syrup and vanilla. Whisk until well incorporated. Add wet ingredients to dry ingredients. Whisk until just incorporated, making sure no flour patches remain. Gently fold in raspberries. 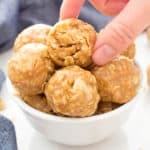 Pour batter evenly into prepared muffin pan—filling each cup about ¾ of the way for a greater quantity of smaller muffins, or all the way to the top for a smaller quantity of big, domed-top muffins. 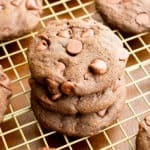 Bake for 22-30 minutes. Mine took 26 minutes. Insert a toothpick to check for doneness—once it comes out mostly clean, it’s done. Place muffin pan on a cooling rack to cool for 20 minutes. Remove muffins from muffin pan and transfer to a cooling rack to cool completely, about 1-3 hours. Enjoy! Storing instructions below. Adapted from my Healthy Lemon Poppy Seed Muffins. You’ll love my Easy Vegan Lemon Almond Poppy Seed Bread and my tasty Lemon Macaroons Recipe (Paleo & Vegan). - Best the first day. If keeping longer, store in the refrigerator for 1-2 more days (but not recommended). Best if eaten on the first day. Click the links below to see the tools & ingredients used to make this gluten free lemon raspberry muffins recipe. Muffin Pans – my favorite muffin pans! I use these day in and day out. Cookie Scoop – an absolute baker’s essential. Great for uniform scooping and distribution of muffin batter. Citrus Zester – so easy to use! Perfect for achieving a fine zest that really brings out the lemon flavor. 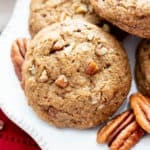 Almond Flour – my favorite almond flour brand. Super finely ground, great quality and taste. 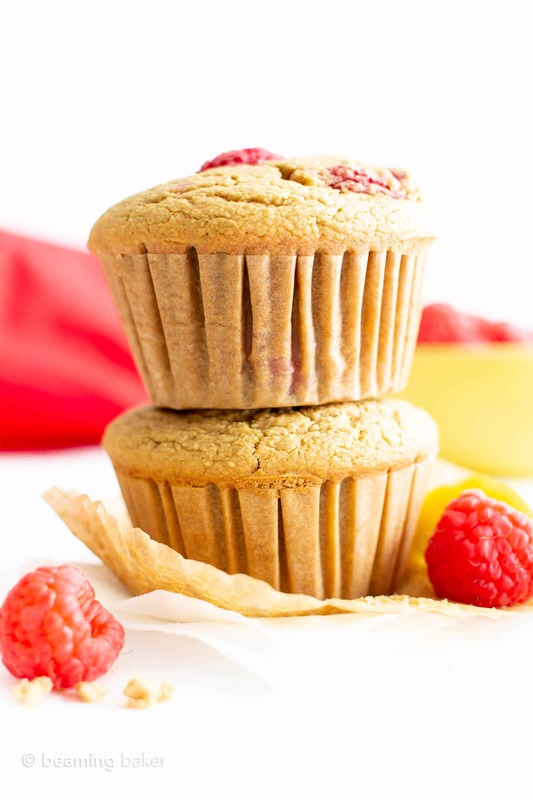 Perfect in these healthy lemon raspberry muffins! Citrus Squeezer – another kitchen essential when you’re working with lemons. Gets so much juice out of those fruits! 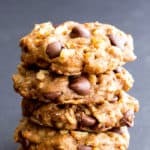 Gluten Free Oat Flour – use this, or try making your own at home with this homemade oat flour recipe. Coconut Oil – an absolute vegan gluten free baking essential. 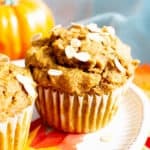 Coconut Sugar – great for keeping this healthy muffin recipe refined sugar-free. 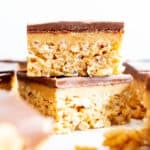 Previous Post: « Fudgy Vegan Peanut Butter Swirl Brownies Recipe – Gluten Free, From Scratch! These muffins look like the perfect combination of fresh flavours! Such a great idea to combine lemon and raspberries. Can’t wait to try them! These are just perfect! I love lemon and raspberry together so I know I’ll love these, and the fact that they are healthy is a bonus! Haha the best kind of bonus! 😉 Thanks Michelle! What a great muffin recipe! I love how you have turned it into a healthy recipe. I don’t have to feel guilty if I eat two of these one morning. Yum’d to save for later. Nope, no feeling guilty here! 😊 Thanks Heidy! These were so good! I loved it!! Woohoo! So glad to hear it Toni! Terrific photos. Love the raspberries peek through the top of the muffins. I definitely want to try these. Thanks Jill! Hope you enjoy. Raspberry and lemon are THE spring/summer combo! 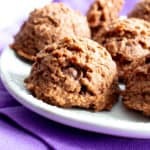 Love these muffins, I can east as many as I want with no guilt! Thanks for the recipe! Couldn’t agree more Eden! 😊 Happy spring baking!